What happens when food stylist, entertaining expert, and cookbook author Susan Spungen finally gets to build her dream kitchen? She does it right. Follow her lead, get tips, and plot your own perfect kitchen in Building a Dream Kitchen on Food52. Today: How to keep your new kitchen from going off the rails. Since March, I've been building my dream kitchen from scratch -- and I'm happy to report we've avoided the headaches and horror stories that you often hear about with these projects. 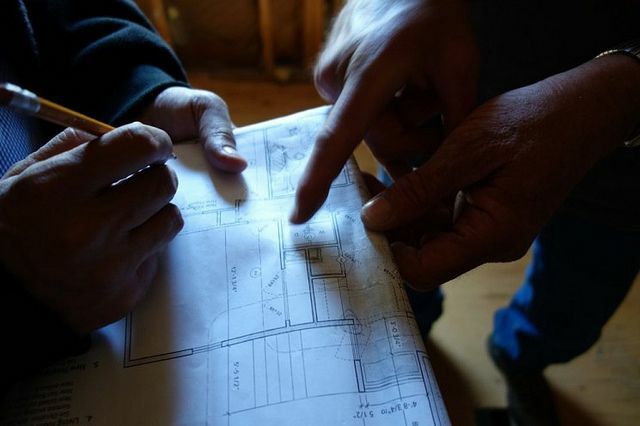 Whether you're building a new kitchen or renovating the one you have -- managing a project like this is tricky and time consuming, to be sure, and requires constant vigilance, so you can stay on top of the project and make crucial decisions at the right time to keep everything on track and on schedule. Since I had done a smaller renovation project before, I had learned a few things, and have tried to put them into practice this time. I have also grilled friends and family who have completed projects in the past for details of their renovation journeys, so I could benefit from their experiences. Thankfully, things have been going pretty smoothly so far, and here are 5 reasons why. 1. Pick the right contractor? Assuming this is not a DIY job, you will need a good contractor. If you are also using a kitchen designer or architect, it’s essential that they have a good working relationship with them, as well as with you. 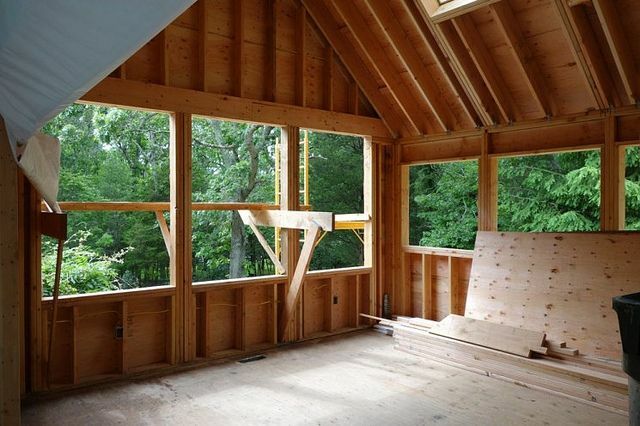 You should get bids from at least 3 different contractors, and meet them all in person. It’s kind of like dating, and you should feel like it’s “clicking” and that you get a good feeling about the person. Many people will advise against going with the lowest bidder. Often the work can be shoddy, or things may be left out of the contract that will come back to bite you later. However, this is not a hard and fast rule -- the low bidder might be smaller and have less overhead, allowing him to extend a lower price. Ask for references from recent clients, and inspect their work in person, if possible. If your architect or designer has worked with them before, all the better. 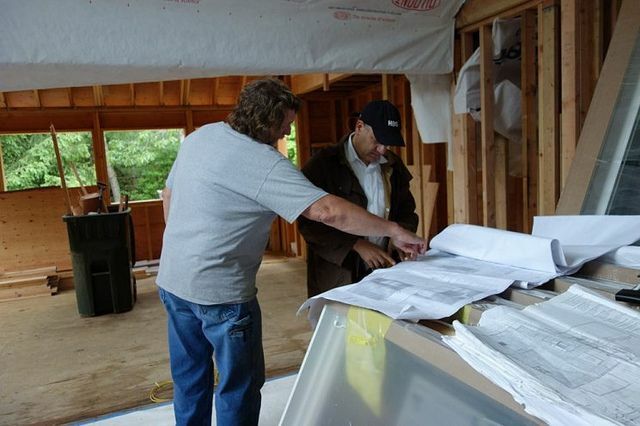 This is Mark Johansen, my contractor, conferring with Andrew Pollock, my architect and friend, on the job site. I was confident in my choice of Mark, since Andy had worked with him on several other projects. I knew they would have a good working relationship. When we first met, during the “blind date” phase, I noticed he wore his tape measure on his belt, which told me he’d be very hands-on. 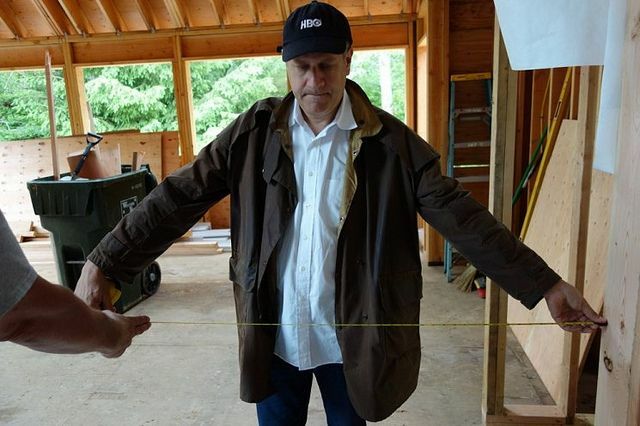 He uses it constantly, not only to measure things, but as a pointer, too! 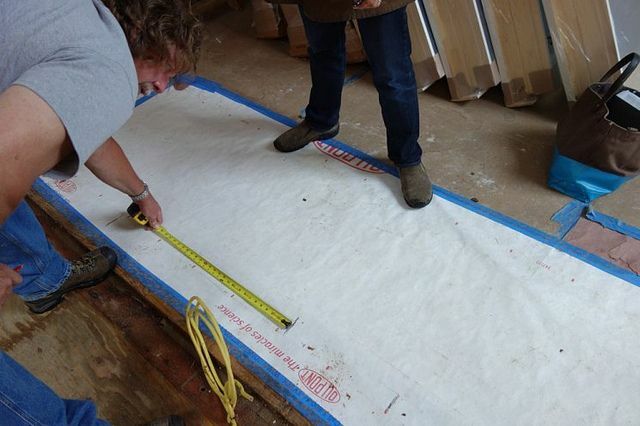 ?During the planning phase, make sure the contractor’s proposal is complete. Spell out as many things as possible in as much detail as possible. Ask a lot of questions, and make sure that it is clear which items are being supplied by the contractor, and what is being supplied by you. If you are supplying something because you can get a better price and your contractor will allow you to do this, make sure it is clear what the installation and handling costs will be. There are so many details to keep track of, even someone as detail-oriented as myself can forget about crucial links in the communication chain. I ordered the appliances myself, and somehow neglected to let my architect or contractor double check the order before I placed it. I ordered a 24-inch wine fridge (so excited! ), and didn’t notice that an 18-inch one had been spec’d in the drawings. The fridge was delivered (and it’s what I wanted) so we had to rejigger the island layout to make room for it. Much easier to do it on the floor in the real space than on paper. Andy is measuring the opening next to where the island will be to see if we should extend the island by 6 inches to accommodate the wine fridge, or make some of the cabinets smaller. We decided the opening should remain at the original size. We sacrificed a little bit of symmetry in the cabinetry so we could squeeze in the fridge. Luckily it all worked out without costing me any money. ?Sounds like a horror movie, and it’s not far off. 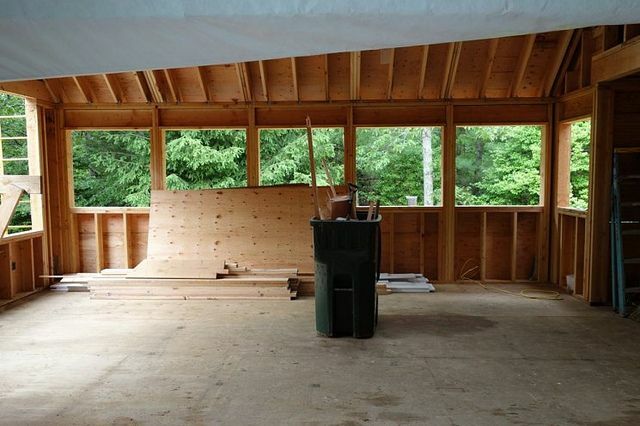 Like everyone always says, any renovation takes longer and costs more than originally planned. Don’t think yours will be any different. Better to save some money (and time) in reserve. It seems that no matter how carefully you plan, there are unforeseen things that can happen that end up costing money or causing delays. “Even without making any changes, a 5% increase over the contracted price is expected and 10% is common,” says Andrew Pollock, PC, who happens to be my architect. I can’t wait to sit in my new dining room and enjoy this verdant view. Many of the trees are evergreen, which is good, since we probably won’t be in until early fall, rather than late summer, as I’d hoped. ?If you are phasing your job for budgetary reasons, make sure you have some idea of what Phase 2 is before you start Phase 1. One thing can impact the other, and can end up costing you more separately than if you had done everything at once, so make sure to discuss Phase 2 ideas with both your designer/architect and contractor up front. There are economies of scale when you already have a crew at your house working, so it sometimes makes sense to stretch a little further than is comfortable to get everything done at once. There are also things that can be done during Phase 1 that will make Phase 2 easier and less expensive. 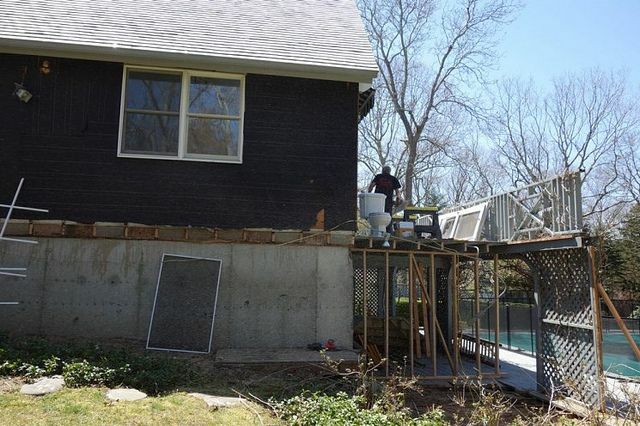 This is part of the deck, and the stairs leading from the upper to the lower deck had to be shorn off to make room for the new kitchen/dining addition. Now we are faced with the reality of how to connect the new stairs to the lower deck, which I was hoping to replace in Phase 2. It may be better to do it now since the new stairs will intersect with it. Stay tuned. Got any kitchen construction tips (or horror stories) of your own to share? Tell us in the comments! I am a food stylist for print and film, a cookbook author, recipe developer, culinary consultant, and dedicated home cook. Renovations are the best part of our home improvement. We take the help of an architect or an interior designer to complete the process of renovation in our home. Whenever we are not satisfied with the design or not have enough space in our home, we need renovation and also when we move to a new home we need to do some kind renovation according to our choice. Here from this article also we learn some basic tips on how to do a better kitchen renovation. Thanks for such a wonderful article. Great I am planning to do my kitchen renovation next month and this seems to be the best schedule. My sister had a kitchen that shared a wall with her dining room. She had the renovation for the new kitchen built in the dining room so that her old kitchen was still functional the whole time. Then when the new kitchen was finished, she have the builders tear out her old kitchen and do some built in cupboards for the dining room and she put a small office hidden behind a sliding door. We just moved into a house that we spent about 9 months renovating - all I wanted was a new kitchen.....#4, Susan, #4. That whole paragraph should be in bold, all-caps. IT WILL COST MORE, IT WILL TAKE LONGER. We do love it though. LOL - Ain't that the truth? That said - 15 years later I still love my kitchen - the layout is extremely functional - although it's time to redo the counters, backsplash and undermount the sinks.